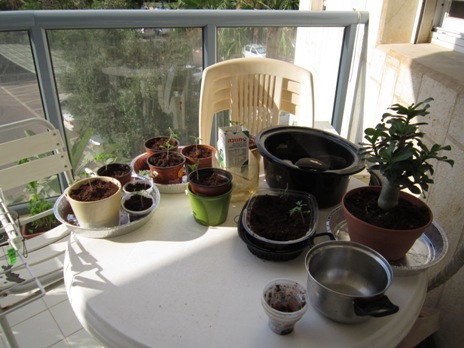 Tomato sprouts growing with AC water: waste not want not! Another hot summer is now upon us and most people in the Middle East that have them are running their air conditioning units at full blast. Many people may not realize that their AC units are also producing large amounts of “run off” water that can be used to flush their toilets, mop their floors, and be used as a source of fresh water for house plants and gardens. Don’t let it go down the drain or evaporate in the sand! The resulting water from air cons is very similar to rain water, which is produced by evaporation of water from the earth’s surface and later returned to earth when the water vapor forms into clouds that later turns to rain. 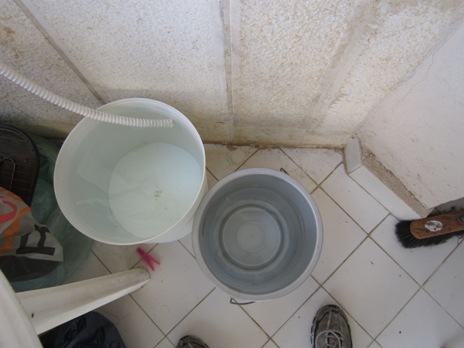 Buckets of fresh water from one small AC unit! The cleanliness of AC water depends on whether it runs off directly when created, via a drainage hose; or allowed to collect underneath an older window type of unit that allows harmful bacteria to grow. The idea of creating water from the air is being studied by a number of people, including the military, where devices are now being used to utilize the run off water of air conditioners in military vehicles in places like Afghanistan. The technology behind devices used for creating needed water for field troops is now being developed for devices that can be used for non-military uses as well. I personally obtain as much as 10 to 12 liters a day from a small 1 hp AC unit, and use this water for plants as well as mopping the floor. A new shopping mall nearby is now using AC run off water for watering its outside landscaping. One thing for sure is that most of the water created by condensation from AC units is still going to waste. If properly utilized, this water might eventually be able to provide for as much as 10 -15% of a community’s fresh water needs in the hot summer months. How can you collect this water? Run a pipe from the air con run off pipe, and collect the water in a bucket for later use. Or if outdoors, let it irrigate your thirsty plants directly. Start a vertical garden: If you have no plants, plant some. Start with some herbs and then move on to bigger ideas, like trees, once you’ve committed to the idea.